A DNS cache is a temporary database maintained by computers operating system. It contains records of all the recent visits and attempted visits to a website and other internet domains. 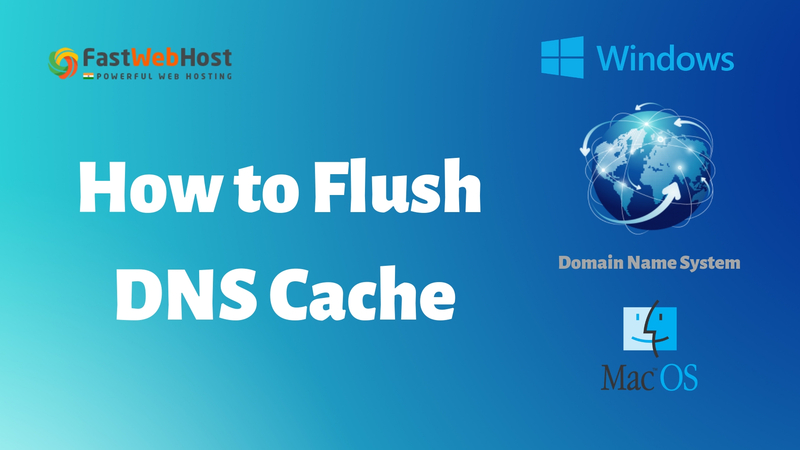 Domain Name System flushing is the mechanism where the user can manually make all the entries in the cache invalid, so your computer re-fetches new combinations by now on whenever it needs and stores in local cache. How to Flush DNS? well, this article helps you to clear DNS on various operating systems. Internet depends on DNS to maintain the record of all the public websites and their corresponding IP addresses. DNS is used so that we need not memorize the IP addresses of all the websites.You type in a URL like Fastwebhost.in and your web browser asks your router for the IP address. The router has a DNS server address stored, so it asks the DNS server for the IP address of that host name. The DNS server finds the IP address that belongs to Fastwebhost.in and then it is able to understand what website you're looking for, after which your browser can then load the appropriate page.There are tons of public DNS servers your network can use to try to speed up the conversion/resolution process, it's still quicker to have a local copy of the "phone book," which is where DNS caches come into play. On your keyboard, type Win+X to open the WinX Menu. Enter cmd in the Start menu search box. NOTE: If you do not see the Run command on Windows Vista, enter run in the Search bar. If the command is successful, the system does not return any output.